So I recently joined some Yahoo groups (Spellbinders-Wizard this one is only to do with those 2 items) and (Die Cuts All which deals with any die cutting or cutting machine), and picked up a few tips already... both can be seen in this card; weaving using Spellbinders die and decorative embossing using Impressabilities stencils. Absolutely love both techniques. 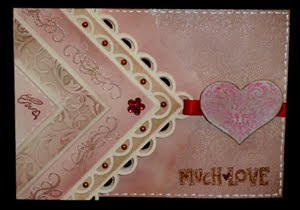 I also used Quietfire Design rubber stamps (flourish Heart & Flourishes on one of the borders). Wow, this is quite impressive, love the detailed 'how to' description you provide.Wonderful card. Thanks for joining us at Lexi's Creations this week. Wonderful! Thanks for playing with Speedy's Friends! Lovely card. Thanks for joining in the challenge at The Crafty Pad this week, good luck in the prize draw. What a fun Valentine!!! Thanks for playing along at Cupcake Inspirations this week! Oh what a fun card. I love the papers, everything is fabulous. Thanks so much for joining us this week for Phindy's Place Challenge. What a cute and fun card. Thank you for playing with Speedy's Friends. Yogi this is fabulous!!! Love the design and layout on here! So glad you shared it with me!!! Thanks for playing along at the Nook this week! Love the two techniques you used to create such a beautiful card. Beautiful creation!! Love the style! Thanks for Cooking it up with Katie this week! What a beautiful fold and card! Thanks for playing with Speedy's Friends! This is lovely! Such an unusual use of the die cuts and a really pretty result. Super technique, she'll love the card! Thank you for cooking it up with Katie this week. Thanks for playing along at Totally Papercrafts this week! Very pretty~ Thanks for joining us at Cupcake Inspirations and Pollycraft Design Challenges this week! Really pretty card and fabulous technique. Thanks for joining our 'Happy Birthday' challenge at Totally Papercrafts. Lovely card! Thanks so much for joining our Really Reasonable Ribbon challenge. Fantastic, what a great design! Beautiful card! Thanks for joining us at Crafty Cardmakers.